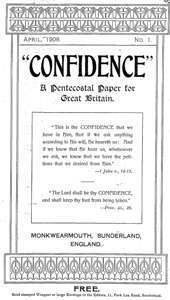 Confidence, an important early English Pentecostal periodical, was published monthly beginning in April 1908. It featured news from England and from the emerging worldwide Pentecostal movement. A. A. (Alexander Alfred) Boddy, the editor and publisher, was an Anglican vicar. The periodical was published from his vicarages: All Saints', Monkwearmouth, Sunderland, England (1908-1922) and Pittington, Durham, England (1923-1926). Some issues of Confidence have not yet been located. If you are aware of the location of missing issues that are not on this website, please contact the Flower Pentecostal Heritage Center at archives@ag.org.